One day only electronic pop laboratory will be established on 26 Nov. 2016, at Ebisu Batica, Tokyo. 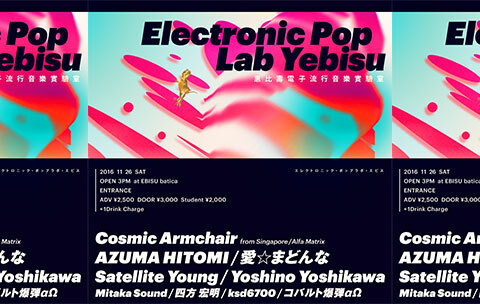 Cosmic Armchair, a synth pop / electro pop duo from Singapore, will be performing for the very first time in Japan, alongside with five electronic musicians from Tokyo, including AZUMA HITOMI, Satellite Young, Yoshino Yoshikawa, Mitaka Sound and ksd6700. For the opening performance, artist Ai Madonna will showcase digital live painting with DVJ Cobalt Bomb Alpha Omega.